Just about everyone has witnessed a spark coming from an electrical outlet or other device, and most have even experienced the feeling of one of these sparks on their hands or other parts of the body. While these tiny sparks are mostly harmless, they can still hurt quite a bit and surprise you if you come in contact with them. Imagine experiencing a spark that is many thousands of times stronger, and you have an arc flash. Arc flashes can occur in an instant and send high amounts of electrical energy through the air. If there is a person in the area, the arc can be directed toward and through them, resulting in severe burns. Approximately 5% of arc flash victims die from the injuries and another 20% experience long term disabilities. Even the luckiest individuals will experience severe pain and burns. This is why anyone who is working around any type of electrical device needs to be aware of the risks of an arc flash, and know how to avoid them. The following are some of the deadliest dangers, and how to minimize the risk. Whenever working on any type of equipment that has high voltage going through it, you need to make sure you are wearing the proper safety equipment. Depending on the situation this will include rubber gloves, boots and possibly even a full electricity resistant suit. This will provide you with protection from not only the electricity, but also the heat that is present during this event. The suit will also help ensure that the electricity is not attracted to your body, which is one of the most significant arc flash dangers. The fact that it only takes moments to put the right equipment on makes it an essential safety step in any environment where an arc flash could occur. 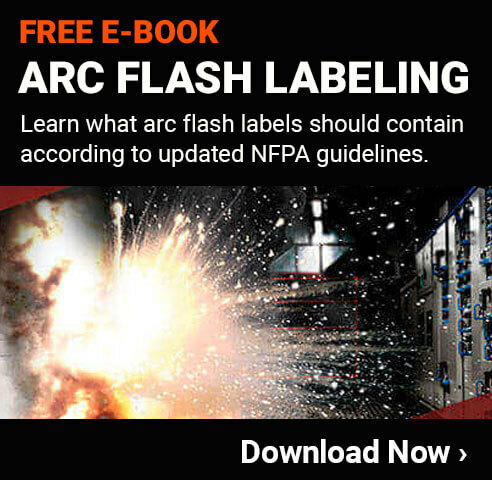 The Institute of Electrical and Electronics Engineers (IEEE) and the National Fire Protection Association (NFPA) have worked together to come up with some warning labels that need to be in place in any area where there is a risk of an arc flash. The regulations involved only apply to certain industries, but the fact is, all facilities could benefit from the improved safety of using the proper warning labels. You can buy this type of safety labeling from a third party, or use an industrial label printer to create the labels for your facility. Not having the proper labels placed in the areas where there is a risk of an arc flash will put everyone at risk. This is because many people are used to looking out for these labels, so if they don’t see them, they assume that there is no arc flash dangers present. The results of this can be deadly. While most people who work with electrical equipment know that the electricity and heat of an arc flash can be deadly, many don’t realize that there are other risks too. One significant risk is the loud noise that is typically created. This is from the pressure from the flash as well as from machines or other items in the area that were damaged. While the sound waves themselves aren’t deadly, they can cause severe disorientation which can put you in significant danger. In addition, the loud sounds can cause permanent hearing loss to not only the individual working on the machine, but also anyone else in the area. This is why hearing protection should be part of the overall safety equipment provided to people working on any electrical equipment in the facility. As mentioned above, arch flashes create extremely high pressure very quickly. This pressure can throw people through the air in an instant. In some cases, it is actually the pressure that is the cause of the most severe injuries or death, which is why it should be seen as one of the most significant arc flash dangers. Unfortunately, there is not always much you can do to avoid the risks associated with the pressure. Even if you are wearing a full rubber suit, for example, the pressure from the arc will still likely impact you quite severely. To minimize the danger, wearing hard hats and other common safety equipment may be necessary. In addition, if there is an elevated risk of an arc flash, consider having padding or other safety devices in the area around where the work is being done to help minimize the damage done from being thrown through the air. Another of the main arc flash dangers is the risk of a fire. When an arc flash takes place, the heat can cause things to ignite almost instantly. This puts the entire facility at risk, and especially those who are working directly in the area. One of the biggest dangers is that the individual working on or around the area where the arc flash occurs may be knocked out or disabled in some way. If a fire starts, they will be helpless to escape. This can result in a death, even if they would have otherwise survived the incident. One way to minimize this type of risk is to ensure safety teams are aware whenever someone is going to be working in a high voltage area. Someone should be observing the work from a safe distance, so that they can respond properly in the event that an arc flash occurs. The safety professional can sound the fire alarm, and then provide immediate assistance to anyone who was injured in the area. While most of the above issues are focused on problems that occur because of an arc flash. This one is a little bit different. Using the wrong tools in high voltage areas can actually end up causing an arc flash to occur. If you’re working with a metal screw driver, for example, and there is a wire that may already be damaged, it may attract the electrical energy from the wire to the screwdriver. This can, of course, cause severe injury. Even if you are wearing rubber gloves, the heat from the flash could cause a lot of burning. This is why it is so important to make sure you are always using non-conductive tools any time you are near a high voltage piece of equipment. You can never be entirely sure that the wires are safe, and it just makes sense to take this type of precaution. The bottom line when looking at arc flash dangers is that there are multiple ways that the arc flash can cause death or injury. This is why it is so important to put safety first in every case. If, for example, it is at all possible to remove the electricity from a machine before working on it, that should be done. Even if this will result in a work stoppage or other inconveniences, it is much better than having a fire or electrocution in the facility. If possible, using a lockout/tag-out system is the best option for keeping everyone safe. This will not only cut the electricity, but also make sure that it is not accidently restored, which will effectively eliminate all of the arc flash dangers.